After 58 years of making sculpture I find that it is a pursuit that I cannot avoid for long. I look at it with curiosity. I am frequently surprised by the way it works. The fall and winter landscapes of western Wisconsin and Colorado, matters of form, have been of continuing importance to me ever since I first walked them. The staunch clarity of some typefaces and designs of some books and posters have moved me greatly. What I read and have read are sources of many ideas I've used: science fiction, anthropology, poetry. Travel: towns and deserts, New York City, Paris, Amsterdam, Rio, Cuzco, Los Angeles, Boston, Mojave, Oregon, Nazca, and more; roadways and air views, all in the company of rare people and almost always in a state of wonder, lead me to my sculpture. 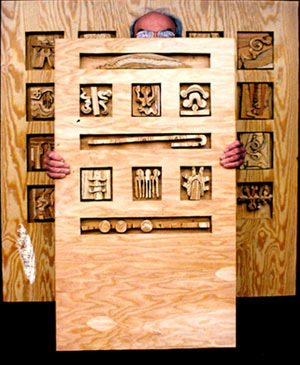 For the last 30 years most of my work has been relief sculpture. In some cases I used mixed woods - mahogany, walnut, cherry, ash, maple, obiche and ebony. In others the sculpture is made from one kind of wood, monochromatic. More recently I have painted my reliefs in brilliant, glossy colors in which sheen and shadow are a big part of the act. I'm presently working with plywood reliefs. The layering of the plywood with its black glue lines and rhythmical repeat patterns plus its physical versatilities and handsome flatness intrigues me. It has the advantage of being a lighter weight wood, which is increasingly important to me. Almost all my sculpture has been made with band saws using narrow 1/16th and 1/4 inch blades, which allow immediacy and great facility with the wood. These saws have become the backbone of my approach to the forms I seek, and to the textures and subtle linear boundary-like character of my sculpture. The following poem by Kalidasa Sakunta,* says something more about me and the mode in which I live and work. I work in as direct a fashion as I can. I rush into some ideas. Sometimes I rush out again. As each piece becomes more ordered my studio becomes more disordered. Then, look I'm done! Committed to each new work as it is, and above all to another, and more besides. Surely there is no end.